To comb or not to comb, that is the question. It all depends on what sort of yarn you want to make. Basically if you want a smooth yarn with little or no fuzz, you will comb it so the fibres lie next to each other in a straight line, rather like a commercial top. If you want a fluffy, fuzzy yarn, the fibres will be carded so that the fibres go all which ways. This fibre comes out in a batt. Then there are all the different combinations in between. This is how most of us spin. I am going to concentrate on how to prepare greasy fleece with the minimum of fuss, using simple and cheap tools you can buy in the pet section of the supermarket. You can use the same techniques on your already washed fleece, but you will find it that much harder to process, and it will require good quality steel tools. I would recommend picking it over first to get rid of any VM left in it, and to remove the worst tangles. Whatever way you decide to do it, the more work you put in at this stage, the nicer your spun yarn will be. your fibres with a dog comb is simple: you comb the tip of the lock, then flip it over to comb the other end, pretty much as you would comb your own hair. Don't be too rough, or the fleece will do the same as your own hair - break! This is best done with a towel over your lap and a piece of leather that you can put the lock on. You will be amazed at just how much dirt comes out while doing this! Any short or daggy bits get caught in the comb, and are best discarded. As you comb, your fibres become a light, airy, parallel bundle. You can leave it like this, or put several bundles together and gently tug at each end to extend the fibres into a sort of mini top, which does make for more efficient spinning, as you don't need to stop and start so much to pick the fibres up. If you are blending pre-dyed locks, you will go through the combing process several times until the fibres are combined to your satisfaction. A new use for Afro combs! I use a pet slicker brush if I don't use my fingers or the dog comb. Size isn't really important; I have several different ones and usually end up using the smallest one, about 1 square inch. They have miniature versions of the teeth you find on hand cards or a drum carder and do an excellent job. The basic technique is pretty much the same as using the comb. You also get a pretty similar result. You can also use them exactly like you would a carder. They can make a batt, just as regular carders make a batt, on a much smaller scale, and there are spinners who use this technique regularly. If you fancy a drum carder, and don't mind making your own, the following web-site is for you! Both the dog comb and the slicker brush can also be used for blending small quantities of dyed fibres, or different types of fibres. They are cheap, easy to use, and easy to clean. I have also found they last a long time and take terrible punishment. You can also buy cow grooming combs, which look like large steel versions of our own personal plastic hair combs, and one of these clamped to a hard surface would be an excellent substitute for a large wool comb or a blending hackle. 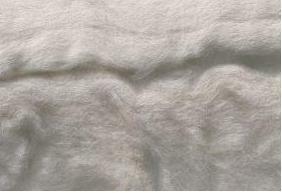 Its worth considering for pre-washed fleece, as that is a lot harder to comb out than a greasy fleece. Now that you have untangled your fleece, combed or brushed it out, and got rid of the nasties in it, you are just about ready to spin your yarn. Combing and carding can also be done with your fingers, and you can use these same techniques to blend small quantities of fibre together.